DELRAY BEACH, FL: For tennis fans, the holidays have come early! 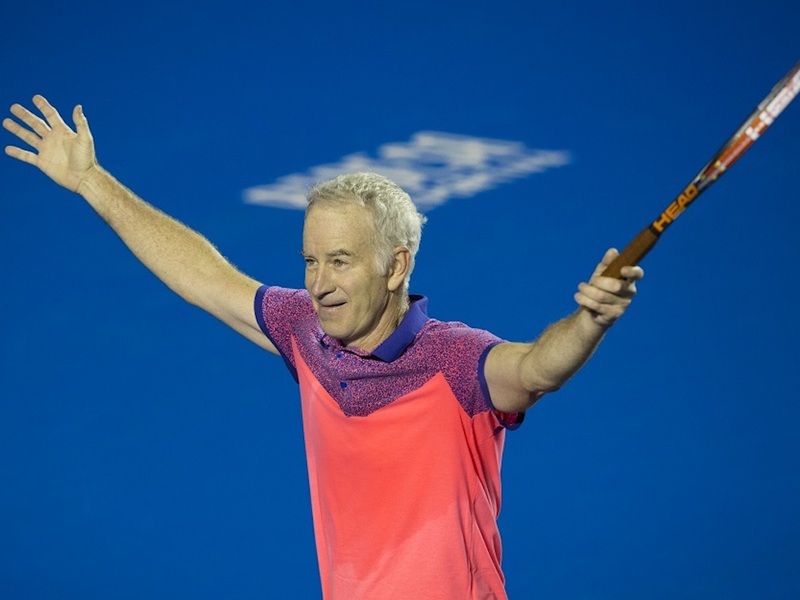 Tournament organizers at the Delray Beach Open have announced that International Tennis Hall of Famer and 17-time Grand Slam champion John McEnroe will return to Delray Beach for his fourth appearance in the tournament’s ATP Champions Tour event February 16-18 at the Delray Beach Stadium & Tennis Center. The Presidents Day weekend USA vs. International ATP Champions Tour matches kick off the 10-day Delray Beach Open that also includes an ATP World Tour tournament—it’s the only tennis event in the world combining an ATP World Tour and ATP Champions Tour tournament at the same event. 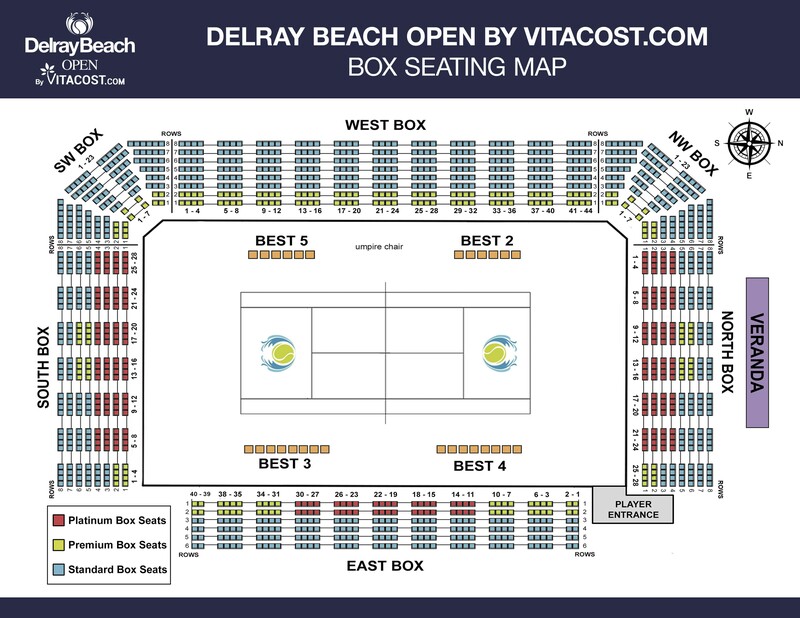 Print-at-home tickets for all sessions make a nice gift and are now available at the Delray Beach Open official website. The action will kick off Friday night (Feb. 16) at 6:00 pm with Fish vs Levine followed by McEnroe vs Rusedski in the 8:00 pm featured match. The much-looked-forward-to doubles match will kick off Saturday’s day session at 12:30 pm and pits McEnroe—perhaps the finest mens’ doubles player of all-time—playing alongside Gambill vs. Gonzalez/Levine. McEnroe and Gonzalez will meet in Sunday’s 2:30 pm singles finale, with the match perhaps deciding the outcome of Delray Beach’s ninth annual ATP Champions Tour event. For a complete schedule of all ATP Champions Tour and ATP World Tour matches, please go to 2018 Delray Beach Open Schedule. Tickets can be purchased online at Delray Beach Open Tickets, at the Delray Beach Open Box Office (30 NW 1st Ave) or by calling the Box Office at 561-330-6000. And a reminder that tickets purchased on-line can be printed out at home. 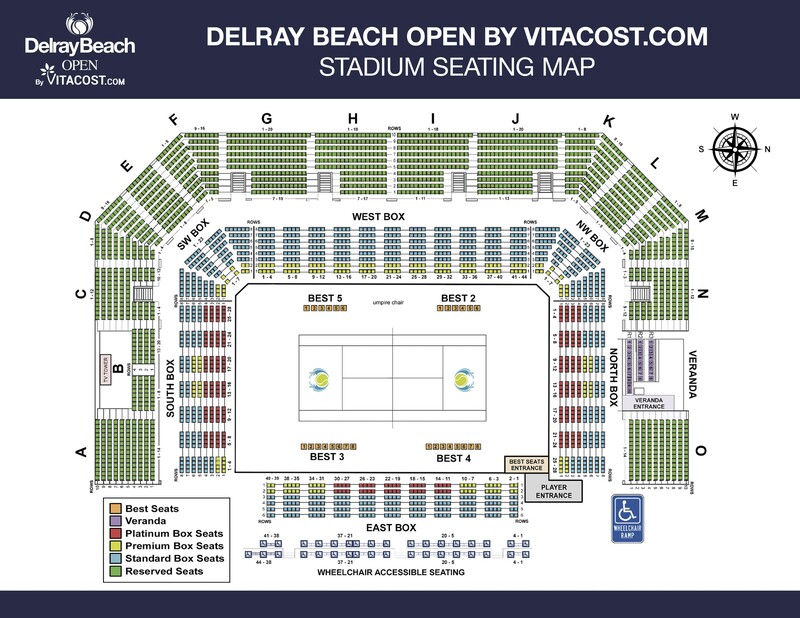 DELRAY BEACH, FL: The Delray Beach Open will be the first ATP event in the United States, and the first ATP Champions Tour event in the world, to feature “Hawk-Eye Live,” the new innovative electronic line-calling on all lines of the court. Last month’s Next Gen ATP Finals in Milan that featured the world’s best under-21 players was the first tournament to use the cutting-edge technology. With “Hawk-Eve Live” calling the shots, the Chair Umpire will be the only official on court during the event. When triggered, the new system will make an instant automated “OUT” call. Because each call will be final, the “Challenge” system in use with current “Hawk-Eye” systems will not be used. However, close calls will be replayed on stadium video boards to benefit the fan experience. All eight ATP Champions Tour matches in Delray Beach will use the technology. The launch of “Hawk-Eye Live” at the Next Gen ATP Finals was the first step in the ATP’s mission of including new technology in men’s professional tennis. The technology has been comprehensively tested and developed over the past 18 months in cooperation with the ATP. The technology has not been used in any other ATP World Tour tournaments or matches. 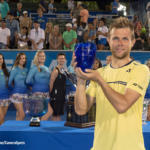 DELRAY BEACH, FL: The Delray Beach Open has launched its first-ever on-line Shop where fans can secure official DBO swag and signature garments from the annual ATP Tour event. And, for a limited time, all selections are 20% off. Initial product categories offered in the Shop include T-shirts, polos, pullovers, hats and visors, with a selection of styles in both men’s, women’s and children’s sizes. Merchandise for the upcoming 2018 tournament is available, and undated products are available as well. During the holidays, the Shop’s already-affordable merchandise is discounted 20% from regular prices that range from $20 to $50. Fans should use promo code HOLIDAY20 on purchases; the offer expires December 25. The shopping portal can be found at Delray Beach Open Shop on the YellowTennisBall.com website. DELRAY BEACH, FL: Aleksandar Kovacevic came home to Boca Raton for the Thanksgiving holiday break but initially found it anything but relaxing. The University of Illinois sophomore won the Delray Beach Open’s “Survivor” pre-qualifying tournament with a 6-2, 6-3 win over unseeded Ricardo Rodriguez Pace. Kovacevic emerged from a field of 130 players after winning seven matches over five days. With the win, the No. 2 seed earned a wildcard berth in the Delray Beach Open’s ATP World Tour qualifying tournament, scheduled for Saturday and Sunday, Feb. 17 and 18, at the Delray Beach Stadium & Tennis Center. The top four finishers in the 16-player qualifying tournament earn spots in the main draw of the 26th annual ATP World Tour event. Kovacevic faced just one Top 10 seed in the tournament. That came in the semifinals when he rallied from a set down to defeat 17-year-old No. 6 seed Ivan Yatsuk of Bradenton, a University of South Florida commit. Kovacevic prevailed 13-11 in the third-set tiebreaker to preserve his spot in the final. Kovacevic turned in a 23-9 singles record last year as a freshman at Illinois, including a 10-1 Big Ten record, and was looking to stay in competitive shape during his college break. Pace, a 24-year-old member of the Venezuelan Davis Cup team, defeated three Top 10 seeded players en-route to the final. He beat No. 7 seeded Henrik Korsgaard in straight sets in the round of 32 and then No. 9 Juan Rocha in a three-set tiebreaker in the round of 16. He recorded a third upset in the quarterfinals, beating No. 3 seed Bar Botzer in straight sets. Pace reached an ATP ranking of No. 298 in the world in 2014 and has three career Futures titles. In addition to Kovacevic, Pace, and Yatsuk, 22-year-old Haitian Hillel Rousseau of Miami rounded out the semifinalists. Top seed Alexandre Rotsaert of Boca Raton was ousted in the round of 16 by No. 12 seed Yeudy Villar of the Dominican Republic. Villar was upset in the quarterfinals by Rousseau in a third set tiebreak.